M.S. 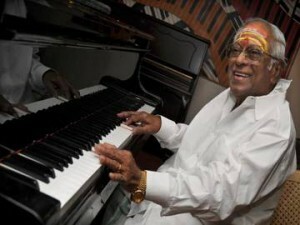 Viswanathan, legendary southern film music director passed away today at 4: 30 in a private hospital in Chennai. He was 87. In a career that longed nearly 61 years, he enthralled music lovers in over 1200 films. Fondly known as Mellisai Mannar (King of Light Music), suffered from breathing problems and is survived by four sons and three daughters. Though unwell since last monthg, his condition deteriorated last week. SP Balasubramanyam and Ilayaraja were some of the friends of MS who visited him in the hospital.